Nothing beats an apple crumble made from scratch. 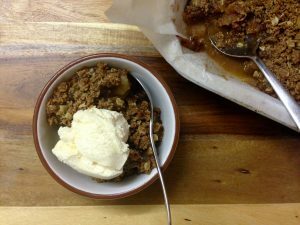 I’ve been known to make a quick apple crumble using tinned apples before, but once you make a crumble using fresh seasonal apples you’ll know it’s totally worth it. 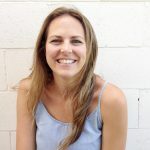 The basic apple compote can be kept in the fridge and served hot or cold for breakfast with yoghurt (my current fave is the Farmers Union Greek with Vanilla Bean) or Coyo (coconut yoghurt) or as a delicious anytime snack. I keep the skins on the apple for extra nutrients and the apple skin also helps the apples hold form. Variations below for gluten-free apple crumble as well as a reduced sugar crumble. Place chopped apples, butter, cinnamon, rice malt syrup and water in a large saucepan and bring to a simmer stirring occasionally. Continue simmering until apples are soft and liquid has reduced. Pour into an oven safe dish. To make crumble topping add dry ingredients to a bowl then rub the butter through the mix with your fingers. It should resemble course sand and be able to clump together when pressed—these are the yummy bits so press away adding a little more butter if needed. Pour crumble mix onto apple mix and bake for 25 mins or until the topping begins to brown and goes crunchy. Remember the apples are already cooked so it is only the crumble top you are waiting for. Serve with your choice of accompaniment: ice cream, fresh cream, custard, yoghurt, Coyo or coconut cream. Reduced sugar- halve the amount of sugar in the compote and crumble mix. Fructose free- use rice malt syrup in the compote and crumble mix. Vanilla and blueberry crumble- stir in 1 tsp vanilla into reduced compete then sprinkle 1/2 cup of frozen or fresh blueberries over the compote before topping with the crumble mix. 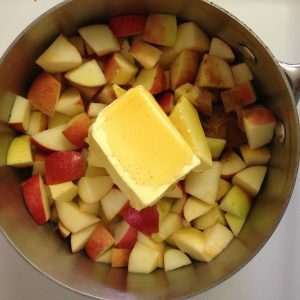 Tips for saving on waste– this recipe is great for using up leftover apples. For those with children, keep a zip lock bag in the freezer and add chopped apples to the bag until you have enough to make a crumble. 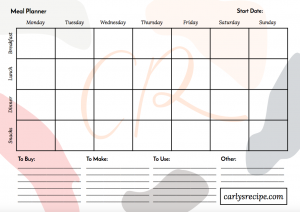 Subscribe Now and receive my FREE menu planner!